The other night at dinner, we were talking about plans and such for the next few weeks. My husband casually mentioned “…and we go to San Diego in a month…” and my eyes popped out of my head. We’re going over Spring Break to visit family. In a month. You know what that means? That Easter is in a little over a month. How in the heck did that happen? I mean, I just got finished with Valentine’s Day. Birthday season is officially over. I’m thinking in mint and rainbows…and now I have to remember that Easter is just around the corner? I need to plan brunch and Easter baskets and and egg hunt? Really? When I think about Easter, I think about egg hunts. And I think about brunch. We don’t do huge things for Easter. It’s usually just the three of us. Once the egg hunt is out of the way at 7:07 am, the day stretches ahead of us. I like to make a fancy brunch (or go to one) because it makes the day seem more special, even for those of us that don’t celebrate it in the traditional way. If you’ve been to any store recently, you’ll have noticed all the fun pastel and Easter candy and baskets that are lining the shelves. Last week I went shopping at Cost Plus World Market and I hit Easter pay dirt! 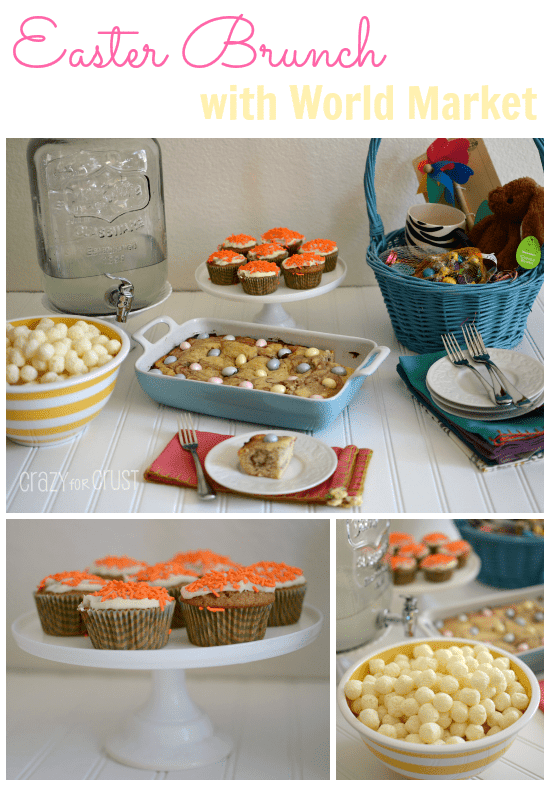 I was able to get a bunch of great items for my Easter brunch table, plus some food and some items for Jordan’s Easter basket! I am in love with World Market. Not only do they have a kitchen section that will make any foodie drool, but their food section is overwhelming – in a good way. They have food products from all over the world! Then, there is the home decorating section (where I found curtains for my family room for 50% off thankyouverymuch), the furniture section, and, my new favorite place in the store, the seasonal Easter section. 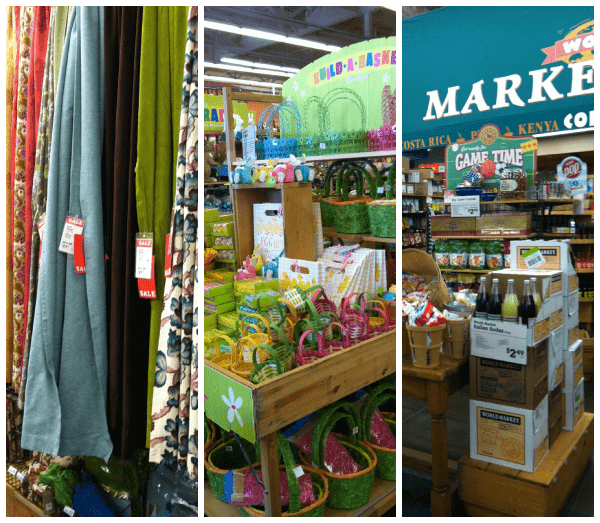 Let me tell you about a few of the items I was totally crushing on at World Market. The white glass cake stand is so pretty – the leg is almost like a candlestick! And it’s a perfect stand to hold the Carrot Cake Cupcakes from the mix I bought. And that yellow and white striped mixing bowl is the perfect size – I’ve already used it tons of times in the kitchen. It’s also perfect to hold the White Cheddar Bunny Tails that World Market sells this time of year. And, perfect for a crowd, the mason jar drink dispenser. I’ve had my eye on a drink canister for awhile and when I saw this mason jar one at World Market it was love at first site! As I was shopping and trying to decide which what to bake with Easter Brunch in mind, I spotted this Raspberry Curd. It totally jumped out at me, because I’ve never actually seen it before. I always see lemon curd in the stores, but never any other flavors. 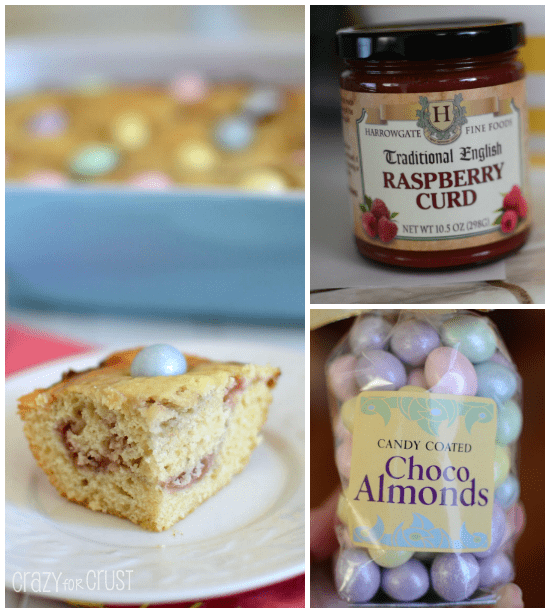 I decided I wanted to make some sort of a bar with the curd…but I wanted it cute for Easter. When I saw the chocolate covered almonds (and that beautiful baking dish), I knew immediately what to make! 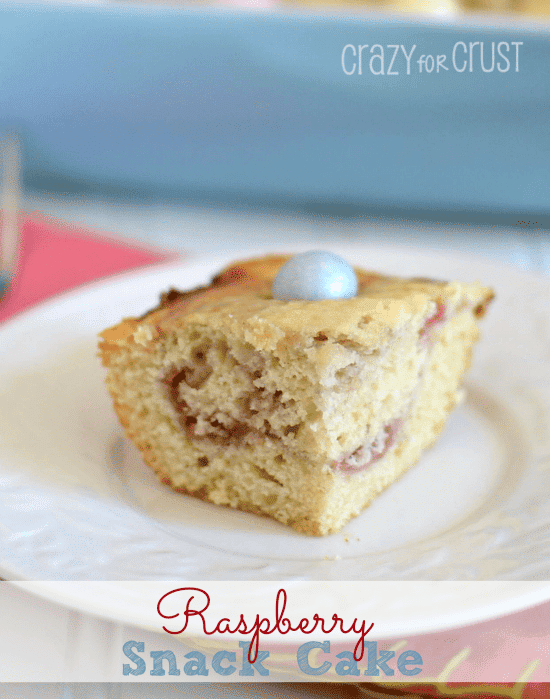 This Raspberry Snack Cake is perfect for breakfast, brunch, or dessert. 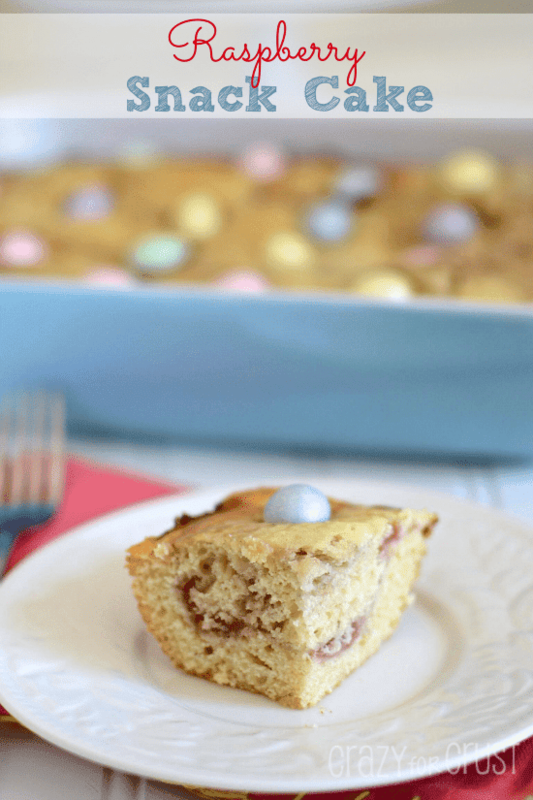 It’s a coffee cake base with a ribbon of raspberry curd flowing through the middle. It’s dense and fluffy at the same time, and not too sweet. Topped with the pastel chocolate covered almonds, this cake is almost too addicting. Seriously, I had to freeze it before I ate the whole thing. I need to save something for Easter morning! I don’t know how anyone shops at any store this time of year without spending a fortune. I wanted to buy one of everything for Jordan’s Easter basket! World Market not only has cute Spring and Easter candy and toys, but they have a whole section of fun things for kids. Remind me never to take Jordan shopping there! 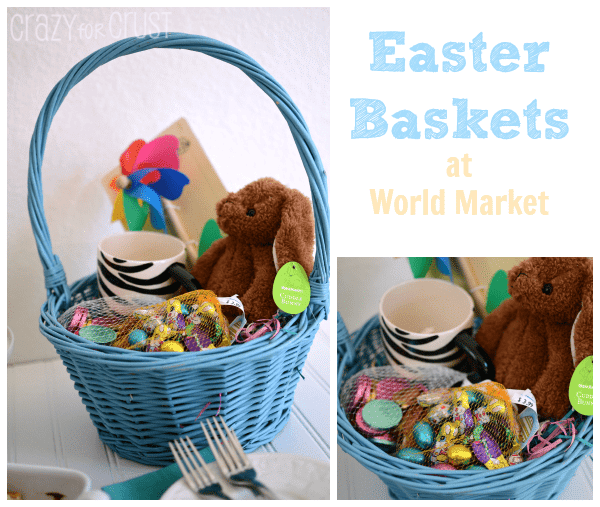 I think this fun Easter basket will be a great centerpiece for our brunch table! You must make this Raspberry Snack Cake. I promise you’ll love it! I can’t wait to inhale the rest. What do you serve for Easter brunch? Preheat oven to 350 degrees. Spray a 9x13” pan with cooking spray. Stir eggs, melted butter, sugar, and vanilla in a large bowl. Add half the milk and half the flour mixture, stir until just combined. Add the remaining milk and flour mixture and stir until the dough just comes together, scraping the bowl as necessary. Pour half the batter into the prepared pan and spread to cover the bottom of the pan. Spoon the raspberry curd over the top and spread lightly with an offset spatula. Spread the remaining cake batter over the top of the curd carefully. 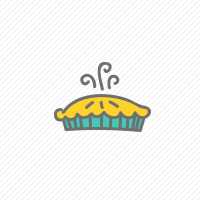 Swirl gently with a butter knife. Bake for 28-33 minutes, or until a toothpick comes out clean. 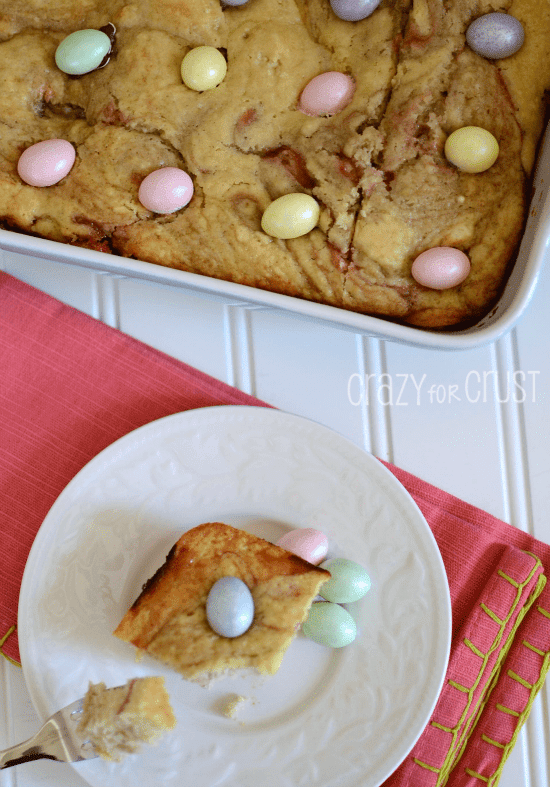 Immediately press the egg shaped candies equally over the top of the cake (so each slice gets one egg). Let cool completely before serving. Disney’s OZ The Great and Powerful in Theaters March 8, 2013. Experience it in IMAX 3D. You can watch the movie trailer here. Guess what? You could win! Win wondrous prizes and celebrate a world of adventure! This cake looks fantastic! And I am seriously in love with World Market! I wish I had one near by me now. Thanks Shawn! A lot of things are different there, I bet! Thanks for reminding me that there’s yet another holiday coming up. I have no idea what we’re doing. Growing up, we always had a ham dinner on Easter. I’ll probably spend the day in a candy coma. (Like I did last year). Hey, we can be in a sugar coma together. 🙂 That’s my usual…these days. Sigh. World Market is a dangerous place. I could blow my whole paycheck there. I am loving the look of this Raspberry Snack Cake. The chocolate covered almonds on top are so cute! I totally could too! Thanks so much Nicole! Lovely dessert table! Thanks for sharing at Two Cup Tuesday at Pint Sized Baker. I’ve pinned it! I’m excited to find this great site. I wanted to thank you for ones time for this wonderful read!! I definitely enjoyed every little bit of it and i also have you bookmarked to see new stuff on your site. Raspberry curd, huh? Sounds absolutely divine . . . I need to find some or try to make some. Love how you used it in this cake, so festive and pretty! Damn, thank you so much for posting this! It is going to help me when I am thinking about going to Regal Beach Boulevard 18 in Jacksonville! Outstanding!